While on your boat or around the dock, do your extended reaching and pulling with the BoatLoop. The Loop or the Hook can capture most anything around the dock. Use the Loop or Hook to reach things in the water or around the dock. Use the Push-Off Stub as a push-away device when too close. The BoatLoops’ Line Handling Hook can be used to hand a line or hang a line. The Large Loop can be used to assist or aid someone distressed in the water. Carry it with you when stepping off the boat. The wind or current may move your boat expectantly. Avoid risk of damaging your boat by getting too close to attach a line. “Get BoatLoop Close” and control your movement to the dock. 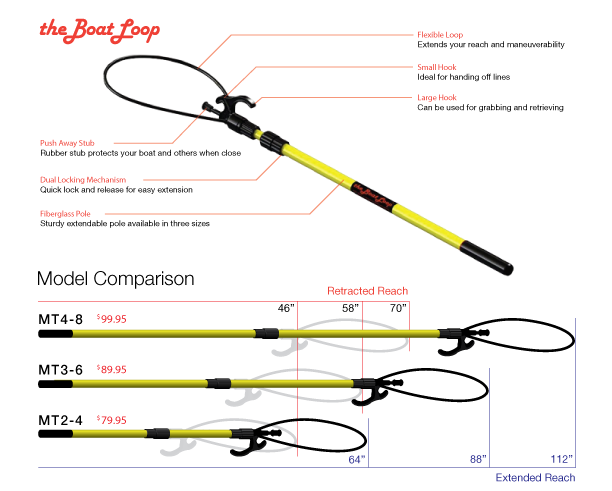 Get BoatLooped… it’s the safe way to extend your reaching and pulling around the boat or dock. In any position of the Extension Pole, hold Twist Grip 1 and Twist Grip 2 and Twist in opposite direction as shown below until it “CLICKS”. Twist Harder, it will “CLICK”. This will lock the Extension Pole. Opposite twist will Unlock the extension Pole. Twisting the Compression Nut on the Base Pole will also Lock the Extension Pole. When using the BoatLoop, place the Loop over the bollard, post or cleat and pull from the Handle Grip. The Loop/Hook head can be removed from the pole for storage if desired by gripping the Large Hook and Twist Grip 1, and twisting opposite direction to unscrew the head. The BoatLoop will FLOAT ONLY if the Extension Pole is extended at least 8” or more.